I love adult coloring books and I LOVE Dachshund doggies! "Happy Halloweiners" dachshund coloring book for Halloween: this is a unique coloring book by illustrator Christine Vencato. If you love dachshunds and anything slightly spooky, then you will adore this book! 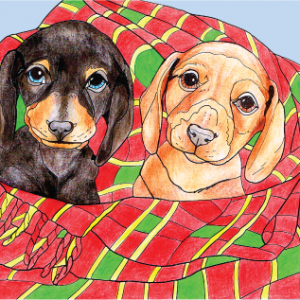 It contains 24 illustrations of cute doxie dogs in two sizes, one per page and two per page. The smaller size is ideal for testing out colors or even to cut out and frame! From haunted houses to enchanted ballrooms, pumpkins galore and even a happy scarecrow, this book will keep you busily coloring for hours and hours. 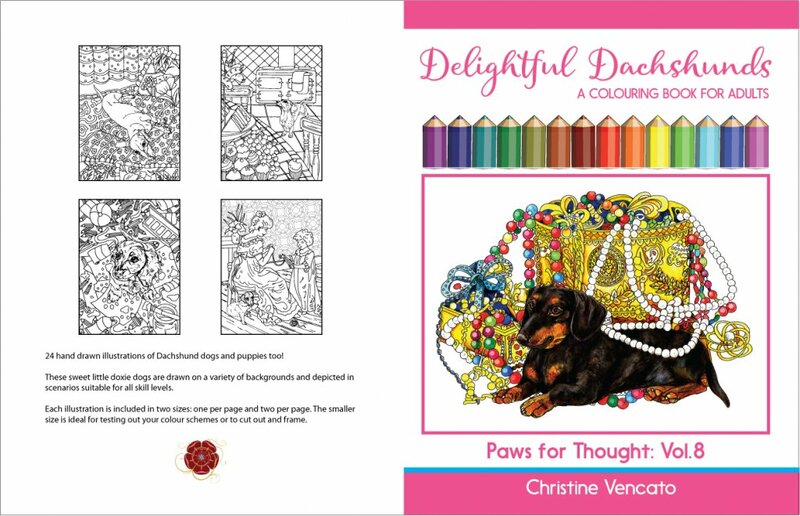 Delightful Dachshunds Coloring Book for Adults is the eighth book in the series ""Paws for Thought" by Illustrator Christine Vencato. If you love these cute little weiner dogs then you will love the pictures in this book! Ranging from easy to highly detailed, there should be a page to suit every mood! This dachshund coloring book (available from Amazon) contains 24 hand drawn illustrations featuring Dachshund dogs in various settings. Each illustration is included in two sizes: one per page and two per page. The smaller size is ideal for testing out your colour schemes or to cut out and frame. There are lots of opportunities to practice your techniques colouring cute Doxie dog and puppy faces. They lend themselves perfectly to the practice of mindfulness and relaxation! 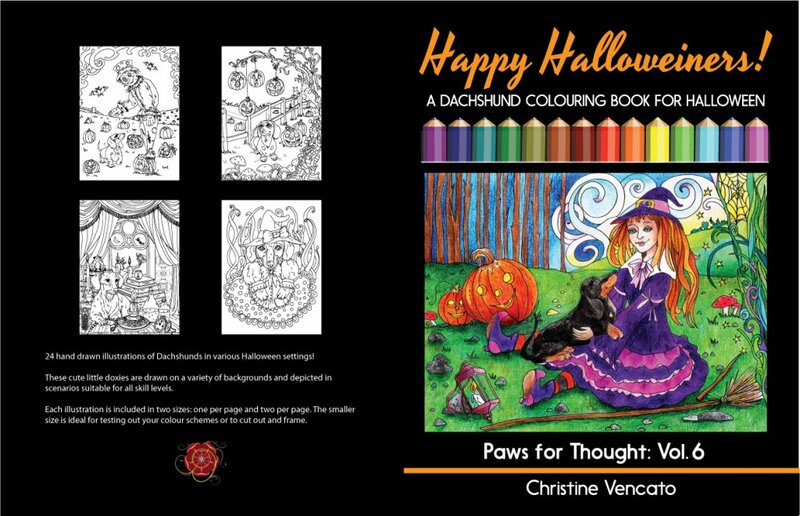 "Darling Dachshunds" is the first adult colouring book from the series "Paws for Thought" by Illustrator Christine Vencato. If you love cute Doxies and need a way to unwind after a busy day, then this book is sure to help you achieve a very happy state of mind! Feel the stress melt away as you color; there are many types of drawing in this book, including intricate patterns and pretty scenery. Although this book is primarily an adult coloring book, there are also some easier illustrations to suit younger colorists too!